I have two more full days left in DC. Two! It’s hard to believe and very bittersweet. I have had an incredible time here, but I am excited to start a new semester at Marquette. I have gotten so much from this experience though, and I feel very lucky to have participated in this program. Any Marquette student reading this who is thinking about the Les Aspin program – DO IT. Tonight a few other students and I headed out to the Army Band concert at the Sylvan Theater, which is an amphitheater at the Washington Monument. I had been looking forward to this for a couple weeks because its selling point is a performance of the Overture 1812 – complete with actual cannon fire. I mean, how could I miss this? 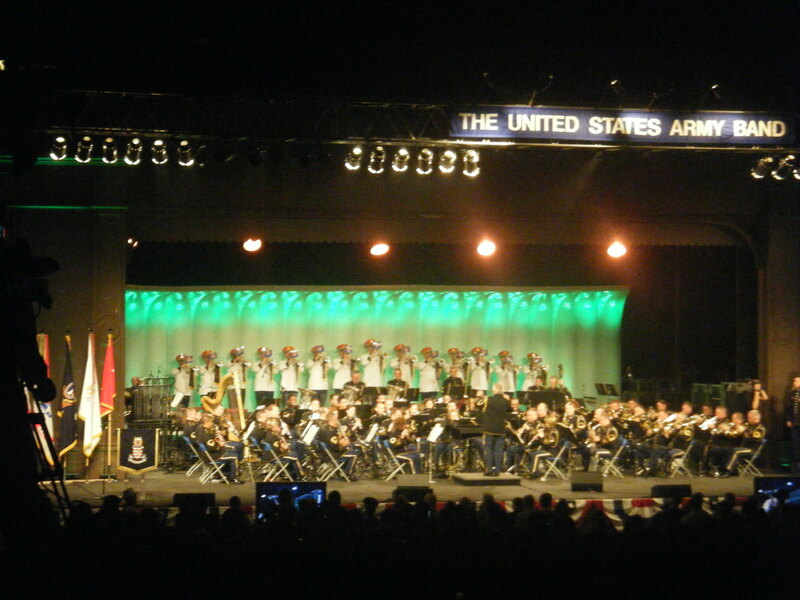 The Army Band in action. The entire show was phenomenal. I was a little disappointed because a few of the musical selections were also played at the Army Band concert on the Capitol steps that I attended a couple weeks ago. But the new material definitely made up for it. I don’t consider myself much of a musical connoisseur nor do I have any specialized knowledge, but it all sounded beautiful to me, and in a perfect setting too – among a crowd of people beneath the Washington Monument on a pleasant summer evening. I don’t consider myself to be passionately patriotic, but it was hard not to get caught up in the patriotism of the night. There was a medley of tunes associated with the different major US wars (Revolutionary, Civil, WWI, etc.) as well as a medley of the service songs of each of the branches of the armed forces. As each song was played, audience members who had either served in the given branch or who had family members who had stood – it was quietly poignant moment. The performance of the Overture itself was FABULOUS. Again, I qualify this with saying I have no ear for music, but the piece is just so complex, sweeping and ebullient. I had never appreciated how perfectly that song builds to its climax – you keep thinking it’s about to take off and then it tones it down again, leaving you on tenterhooks waiting for the inevitable peak.its hard not to have a big grin on your face at the end of it because it’s so bombastic and exhilarating. The cannons certainly helped with this feeling. It seems to me that if I couldn’t be here for the 4th of July, this is the next best thing – I can’t imagine another event being so perfect for summer in DC.